Hammer COBRA XT Durable Materials – 10 Resistance Levels – LCD Display Screen – Fold-able for Easy Storage – Wheels for Easy Transportation – Certified & Approved – 2 Year Warranty. High end VIEW PRICE HERE! PureFitness & Sports Fold-able – Transport Wheels – 8 Manual Resistance Levels – Ergonomic Seat – Large Foot Pedals – In-built Pulse Measurements – Large LCD Screen – 2 Year Warranty. Mid range VIEW PRICE HERE! York Fitness R301 Smooth Design – Easy Transportation – 16 Resistance Levels – 16 Training Programs – Backlit LCD Monitor High end VIEW PRICE HERE! Skandika SF-1140 Regatta Pro 5 Trains Multiple Muscle Groups – Optional Chest Strap for Heart Monitoring – Extra Quiet – Training Display – Easy to Fold and Store- ISO 9001 Certified Mid range VIEW PRICE HERE! Viavito Sumi 10 Resistance Levels – 7KG Fly Wheel – LCD Console – Folding Design- Ergonomic Seat – Large Pedals- Transport Wheels-Fold-able design. Affordable VIEW PRICE HERE! Many people are interested in buying personal gym equipment for home use but they are put off because they don’t think they have enough space for a large exercise machine. If you live in a smaller space like a studio or a flat or you don’t like clutter and want to be able to store your machine out of the way when it’s not being used then a folding rowing machine may be the perfect choice for you. Lots of exercise machines will be advertised as ‘compact’, but if space is a big issue for you the only way to ensure your rowing machine won’t take up too much room and inconvenience your is to buy a machine that can be folded and stored when you’re not using it. These machines also tend to be lighter and more compact so they will be easier to transport and they can be used in smaller, more confined spaces if you haven’t got a lot of room. There are many foldable rowing machines out there and we understand shopping for gym equipment can be stressful and time consuming, so to make things easier we have compiled a handy and in-depth list of the top 5 folding rowing machines available on the market right now. 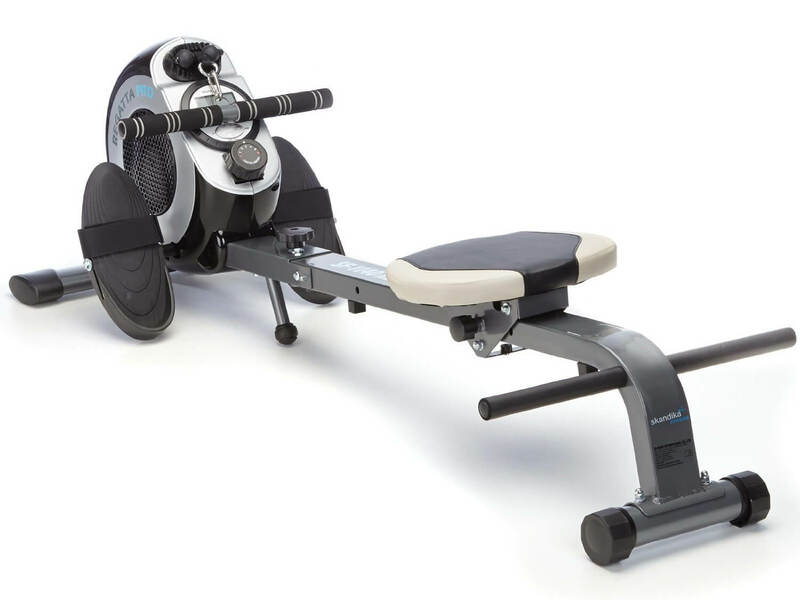 This is an impressive fold-able rowing machine that has been designed by a reputable company and comes with loads of extra perks (CHECK PRICE!). Read on to discover more. This is a strong and resilient rowing machine that comes with an aluminium and coated steel frame, both of which are durable and long lasting materials. The Hammer Cobra Rowing Machine comes with 10 manually adjustable resistance levels, so you can increase the intensity of your workout over time. Many comparable rowing machines have around 7 resistance levels, so the Hammer Cobra is the better choice if you are interested in long-term results. This rowing machine comes with an LCD display screen that will show you the distance you have hypothetically travelled, the amount of time you have been exercising, the amount of calories you have burned and your pulse. These displays can be really helpful for increasing motivation and working on your goals particularly if you are exercising alone because they help you pick a goal and stick to it. If for example you want to burn 100 calories per exercise you can clearly monitor your progress and make sure you achieve that goal every time you work out. The Hammer Cobra is fully fold-able and easily stored when not in use, and it also comes with transport wheels so it can be easily moved through your house. Rowing machines don’ tend to be light so the wheels are going to come in handy when you first receive the machine and have to move it into its desired location as well as when you want to store it away. This machine has been TUV certified and CE approved according to German quality standards. German made exercise machines are often thought to be the best quality in the world, so this is definitely a perk. The Hammer Cobra comes with a 2 year warranty to cover all parts. This is really important because not only will this warranty protect you from any accidental damages over the next two years but it also shows that the manufacturers at Hammer are confident in the quality of this product. Features: Durable Materials – 10 Resistance Levels – LCD Display Screen – Fold-able for Easy Storage – Wheels for Easy Transportation – Certified & Approved – 2 Year Warranty. This PureFitness model is easy to transport, it has been designed for extra comfort and it will give you a great work out. Read on to discover more. Not only is this PureFitness model fully fold-able for easy storage and it also includes front facing transport wheels for easy movement. It is all very well to be able to fold your rowing machine, but if you can’t move it out of the way in the first place it’s not that helpful. This PureFitness model can easily be wheeled out of the way and then folded and stored until the next work out. This PureFitness rowing machine has 8 resistance levels which can be manually adjusted via the machines tension dial. It is important to have a variety of resistance levels if you want to improve your fitness over time because it encourages you to push yourself and not stay within your comfort zone. The foldable Pure Fitness rowing machine has been designed for extra comfort and comes with a large ergonomic seat as well as a glide board for smoother movement and large foot pedals. These foot pedals come with Velcro foot straps so you can ensure your feet are secure no matter how large or small your shoe size is. This machines hand bars can measure your pulse without any need for a chest band or complicated wires and it can use this information to tell you how much you are pushing yourself during your workout. The PureFitness rowing machine comes with a clear and large LCD display screen that feedback detailed information on the distance you have travelled, the amount of strokes you have done per minute, the amount of calories you have burned and your pulse reading. This machine comes with a 2 year warranty, so you can rest assure that you are protected from any manufactured or accidental damages for the next two years. Features: Fold-able – Transport Wheels – 8 Manual Resistance Levels – Ergonomic Seat – Large Foot Pedals – In-built Pulse Measurements – Large LCD Screen – 2 Year Warranty. This York Fitness rowing machine has loads of impressive features within its compact and fold-able exterior. Read on to discover more. This Unisex York Fitness machine has been designed to be extra natural and smooth. It harnesses magnetic and air resistance as well as its 6 kg fly wheel to make your rowing workout as smooth and enjoyable as possible. The R301 York Fitness model has transportation wheels for easy manoeuvring. Lack of space isn’t an issue with this machine as it is easily folded and stored away when it’s not needed. The York Fitness Rowing Machine comes with 16 resistance levels. In order to improve you need to be able to increase your resistance levels so you can keep challenging your body and seeing results. The York Fitness machine has so many levels to choose from that a lack of options shouldn’t be a problem and these levels will help you improve your fitness and lose weight over the months and years to come. The York Fitness Rowing Machine also comes with 16 work out programs that you can choose from to challenge yourself and monitor your progress. These 16 programs are made up of 12 pre-set training programs that focus on particular goals like weight loss or body conditioning, one heart rate program, one recovery program and one race. Training programs are a great way to keep motivated and develop goals especially if you are training alone, and these 16 programs are more than enough to keep you occupied for quite some time. This York Fitness Rowing Machine features a 7” backlit LCD display monitor that will show you the amount of calories you’ve burned, your distance in metres, the amount of strokes you have completed, your target heart rate and you even have the option to create your own profile and set your own challenges. This Skandika rowing machine is designed to be as realistic as possible and the company claims you can train up to 86% of your muscles with this machine! Read on to discover more. The Regatta Pro 5 has been designed to feel as realistic as possible so you get as much out of your machine as you possibly can. You can use the Skandika Pro 5 to train your legs, core, back and upper body simultaneously and you can also use this machines pull handle for isolated arm exercises. The Skandika Regatta model uses telemetric heart analysis via an optional chest strap that it will use to monitor and display your heart rate. This is a great way of checking how hard you are working and making sure you don’t over work yourself. This rowing machine has been designed to be extra quiet and low maintenance. 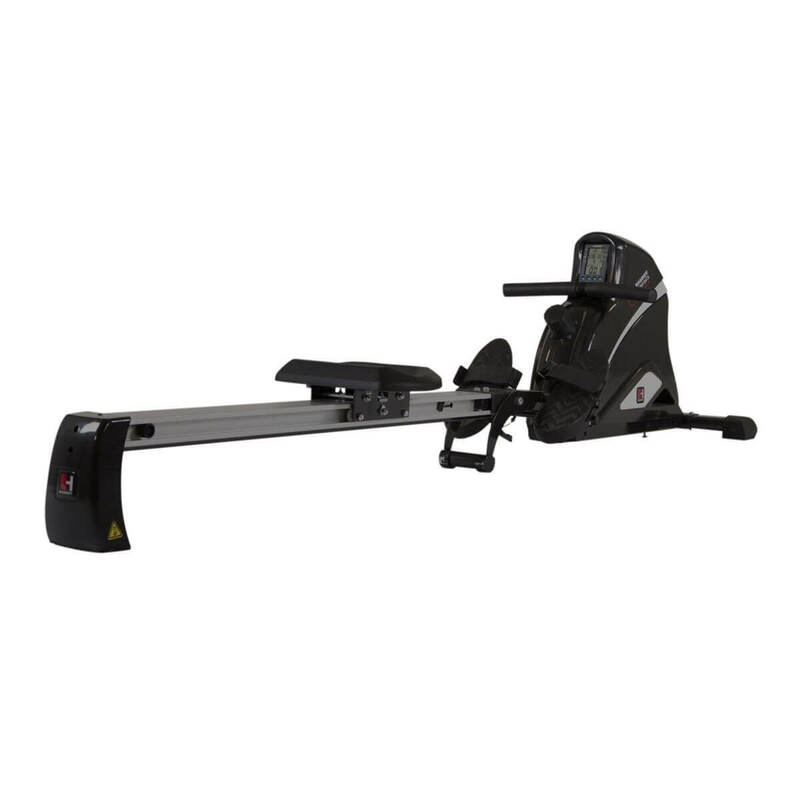 This rowing machine comes with a built in training computer that will display your speed, calories, time and strokes to help you keep track of your progress and develop new goals. The Skandika Regatta rowing machine is easy to fold away when not in use via its two handles, and these handles are also adjustable so you get more variety in your workout. All Skandika facilities are ISO 9001 certified. Features: Trains Multiple Muscle Groups – Optional Chest Strap for Heart Monitoring – Extra Quiet – Training Display – Easy to Fold and Store- ISO 9001 Certified. This Viavito Rowing Machine is a great affordable option for those of you who want to lose weight and/or gain muscle without spending a fortune on exercise equipment. Read on to discover more. Despite it’s comparatively low price this Viavito Rowing Machine comes with 10 impressive friction-free resistance levels. It is very important to have a variety of resistance levels to choose from and as the Viavito gives you 10 to work towards it should keep you busy for a long time. The Viavito Rowing Machine also comes with a 7kg Fly Wheel and can hold up to 120 kg, so anyone who weighs 120 kg or less can use this machine safely. This machines LCD console will keep you up to date on all your progress including the amount of calories burned, distance travelled and strokes per minute. This rowing machine has an easy to use folding design, an ergonomic seat designed for extra comfort and large pedals with adjustable foot straps. It is easy to transport this machine around your house thanks to the Viavito’s attached transport wheels. Features: 10 Resistance Levels – 7KG Fly Wheel – LCD Console – Folding Design- Ergonomic Seat – Large Pedals- Transport Wheels-Fold-able design. These are all great rowing machines that will help you build muscle, lose weight and help tone your body and improve fitness levels but there can only be one winner. 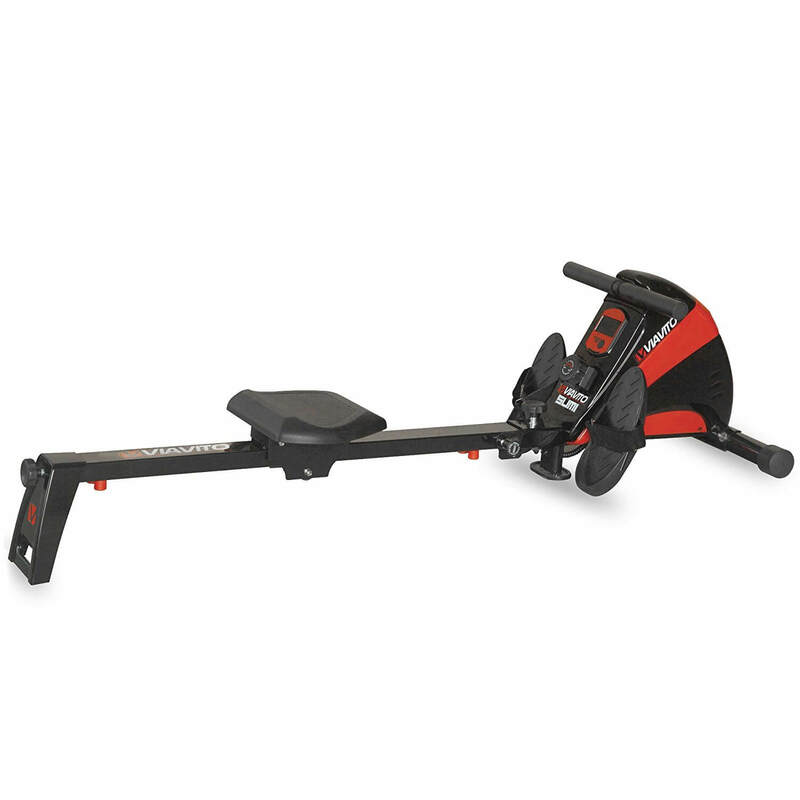 First place goes to the Hammer COBRA XT Folding Rowing Machine – German Brand, 2 YEAR WARRANTY because of its durable design and strong materials, its impressive amount of resistance levels, its easy to manage fold-able design, its reputable German brand and its 2 year warranty.